Welcome back to the The Blaine Health & Wellness blog! In our last couple blogs we shared tips for preventing sports injuries in children. Even though our kids seem to be able to bounce back from injury and may even have a more difficult time becoming injured than us, they are still susceptible to major injuries. Read part one and part two to learn more and stay right here to learn more about the DMR Method. Often when a patient gets the diagnosis of a herniated disk, they resign themselves to not only surgery, but also many months of recovery and time spent laying low. However, for Sarah that wasn’t the case. Instead of opting for surgery, she began treatment for her herniated disks using the DMR Method. Only six months after she began treatment, she was able to begin training for a marathon, and a year after treatment she ran the Chicago marathon. Sarah’s story shows not only the effectiveness of this method, but also the efficiency of a DMR treatment plan. The DMR method is a holistic approach to healing herniated disks and other conditions that are usually relieved with pain pills and “fixed” with surgery. DMR employs chiropractic adjustments, physical therapy, massage, traction, and joint manipulation to not only address the root of the issue, but to avoid pain medication and surgery altogether. 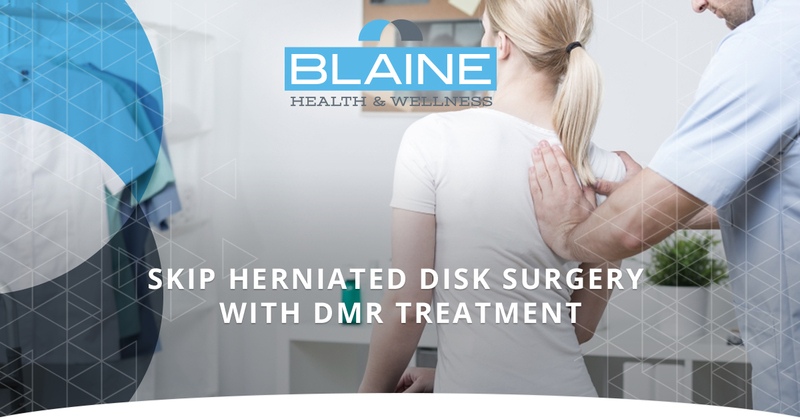 To learn more about the DMR method and what if could do for you, visit the Blaine Health & Wellness website and speak to one of our chiropractors. A disk is the cushioning material made up of tough exterior and jelly-like interior, that exists between each disk of your vertebrae. When a disk becomes herniated the inner soft material of disk pushes out of a tear in the disk’s exterior. Those who have a herniated disk will usually experience pain, numbness, and weakness in an arm or leg. However, some never experience symptoms. Pain will typically occur in the shoulder or arm, if the herniated disk is in your neck and in your buttocks, thigh, and calf if the injured disk is lower. A person will often experience pain when they move in certain ways, cough, or sneeze. In addition to pain, a person with a herniated disk will often experience tingling and numbness in the arm or leg due to the affected nerves. The muscles of the affected nerves will often weaken causing a person suffering from a herniated disk to stumble or to be unable to lift or hold certain items. If you think you might have a herniated disk, make an appointment with our caring health professionals at Blaine Health & Wellness! We provide chiropractic care, physical therapy, and other treatments in addition to the DMR Method. We would love to help you avoid surgery and the side effects of pain pills to be able to, like Sarah live the life that you want. Relief is a phone call away. Contact the chiropractors of Blaine Health & Wellness today!